The County Council presented legislation on April 24th, by request of the Planning Board, to officially begin the legislative process for the Zoning Ordinance Rewrite. There are numerous ways for residents to engage in this legislative process. Visit the Council’s Zoning Ordinance Rewrite portal to view the legislation, for updates and to provide comments . The Council’s first work session took place on Monday, May 14th, at 7:00 p.m. Thank you to the numerous residents who attended. The next work session will take place on Monday, June 4th. This work session is for staff and agencies to provide comment on CB-15-2018 . The next session taking public comments will be Tuesday, July 10th at 7:00 PM. View the schedule of work sessions here. 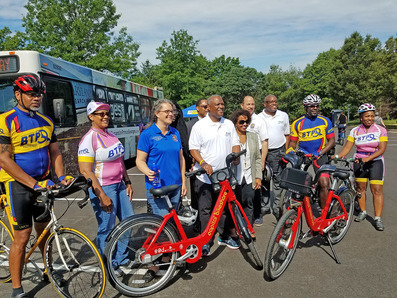 CAPITAL BIKE SHARE LAUNCHES IN PRINCE GEORGE’S COUNTY ON “BIKE TO WORK DAY"
Prince George’s County celebrated “Bike to Work Day,” on Friday, June 1st, at the Wayne K. Curry Administration Building in Largo with giveaways, healthy snacks, bicycle-related demonstrations, music, and much more! Chair Dannielle Glaros joined County Executive Rushern L. Baker, III, on a Capital Bikeshare ride from the Curry Building to the Largo Metro Station, after which Council Chair Dannielle Glaros helped cut the ribbon at the Capital Bikeshare dock at Riverdale Park Station and presented a Council Proclamation. to subscribe via email or text to receive the latest information from the County Council. The new design is more consistent with our County Council website and will offer subscriptions to our latest news, calendars and special topics. Be sure to revisit your subscription preferences to add more topics. Your current subscription will be transferred to the new design without interruption. The Prince Georges County Council congratulations the Class of 2018 on a job very well done! 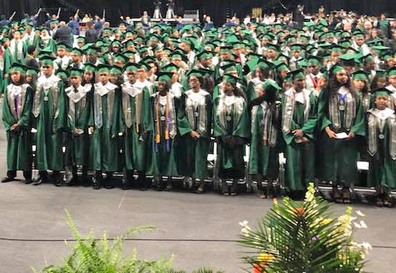 Council Members attended commencement ceremonies throughout the county including the Charles Herbert Flowers High School graduation on may 29th at the Xfinity Center in College Park pictured above.